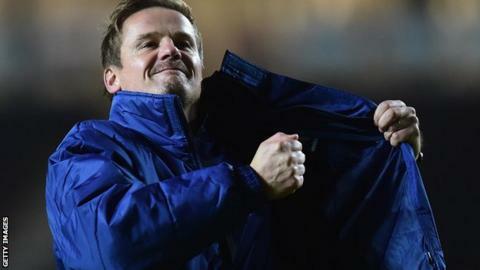 AFC Wimbledon manager Neal Ardley has dedicated their first victory over MK Dons to the club's supporters. AFC, formed when the old Wimbledon were given permission to relocate to Milton Keynes in 2002, beat the Dons 3-2 in the Johnstone's Paint Trophy. "I know what the fans have been through and the pain they have had. It's great," Ardley told BBC London 94.9. "They will be dancing in the streets. The main thing is we have made a lot of people happy and that makes me happy." AFC Wimbledon were formed in 2002 by Wimbledon FC supporters dismayed by the FA's decision to allow the club to move to Milton Keynes. Since their creation they have risen from the ninth tier of English football to League Two, having reached the Football League in 2011. The two clubs had met twice before in the FA Cup second round in 2012 and the first round of the League Cup earlier this season, with MK Dons winning on both occasions. "In the first game they perhaps beat us fortuitously. In the League Cup they beat us fair and square, and this time round we beat them fair and square. It is third time lucky." said Ardley, who made over 300 appearances during an 11-year spell for Wimbledon FC. AFC Wimbledon trailed 2-1 at half-time but Ardley made a triple substitution with 25 minutes remaining, bringing on winger Sean Rigg and strikers Adebayo Akinfenwa and Matt Tubbs. Akinfenwa set up Rigg for the equaliser three minutes after coming on and then scored the winner with 10 minutes left. "We had a plan to put a team out full of energy and would be disciplined as we know we wouldn't be having the lion's share of possession. "We gifted them two sloppy goals, but we showed character to keep going," Ardley said. "It was the plan to try and get to 60-65 minutes and then unleash the three big gun subs we had waiting in the wings. "You go for it and if you lose by more, at least you have had a crack at it. Everyone played their part and it is great when the substitutions do work." Akinfenwa was aware of the importance of his winning goal to the club's supporters. "As a professional you always want to give your best and I'm glad I made an impression," the 32-year-old told BBC London 94.9. "This is real talk - and I think all the players will say it - but it was definitely for the fans. "I was getting a lot of tweets beforehand saying to give our all and I think we did that as a team." Is it OK to admire MK Dons?